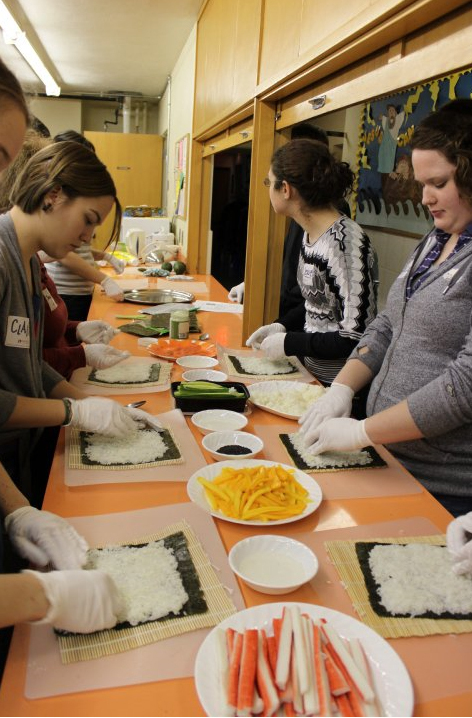 Youths prepare Japanese food during a recent event at Holy Cross Lutheran Church in Kitchener, Ont. KITCHENER — God’s crazy about food. Just ask Ukrainian seminarian Oleg Schewtschenko. The soon-to-be-ordained minister used sushi and other Japanese delicacies February 28 to show 35 youths how God uses food to reach his people. The afternoon of fun, food and fellowship took place at Holy Cross Lutheran Church in Kitchener, Ont. and kicked off with a devotion incorporating Old and New Testament passages. After the devotion, Schewtschenko called on professional chef Karen Stickel to help the youths prepare several Japanese dishes. Drawing on seaweed, mango, avocado, crab and smoked salmon, the youths rolled up their own sushi rolls. They then crimped dumplings bursting with beet and garlic. Chop sticks in hand, everybody sat down to reap the benefits of their hard work – which were, of course, accompanied by green tea and pickled ginger. Schewtschenko recently completed his studies at St. Catharines’ Concordia Lutheran Theological Seminary. He will be ordained March 28 by Robert Bugbee, president of Lutheran Church–Canada and will serve a congregation of the Synod of Evangelical Lutheran Churches of Ukraine (SELCU).